The practice dates back to the pre-Roman days, but the name comes from an eighteenth century French decorator and art dealer Jean-Baptise Glomy who is credited for reviving the process. 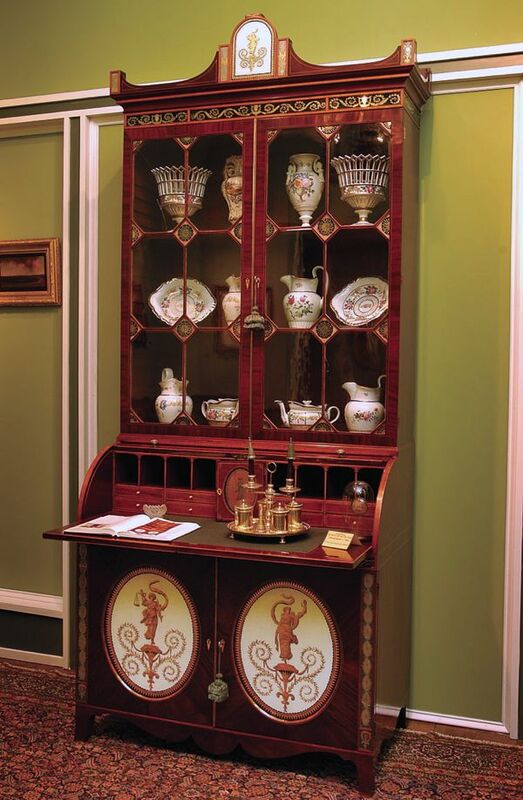 It also was very popular during the Federal period, frequently used then to decorate case pieces. Joseph Barry, a Baltimore maker, is known for mastering the technique. I spotted several examples of the beautiful practice of verre eglomise when I made the design rounds this fall, like the gorgeous coffee table by Fontana Arte shown above at Bernd Goeckler’s booth at the Salon Art+Design. Bernd Goeckler displayed more at the International Fine Art and Antique Dealers Show. You can catch a glimpse of the monumental 25 panels of verre eglomise created by Paule Ingrand, in France c. 1942 behind the chandelier in their always chic booth. The panels depict the myth of Diane the Huntress. I shot some details–tricky because of the reflection–but I hope you get the idea. The technique is a show house favorite. Over at Holiday House NYC, designer Patrik Lonn used verre eglomise in a more contemporary way with an installation in the back of a bookcase. Who can forget the memorable ceiling by in room in the 2011 Kips Bay Showhouse. Who can forget the memorable ceiling by Miriam Ellner in Celerie Kemble’s room in the 2011 Kips Bay Showhouse. Celerie Kemble’s room in the 2011 Kips Bay Show House with its verre eglomise ceiling. Designer Darren Henault also used reverse painted glass in his Kips Bay room, this time on the closet doors. Via World of Interiors. 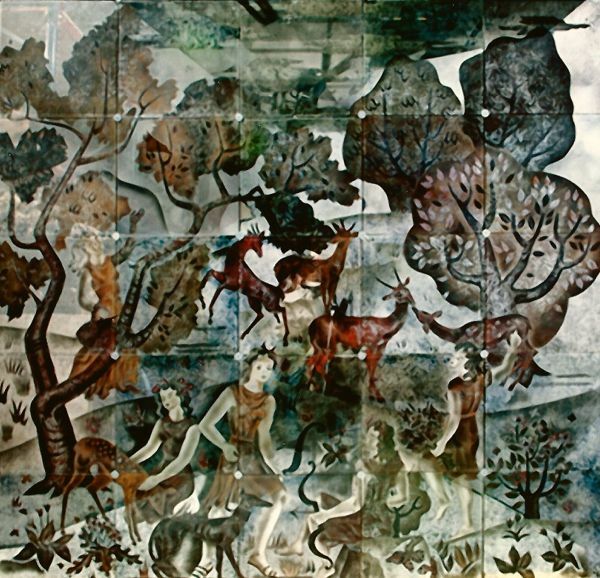 Verre Eglomise walls. I have a small bit of verre eglomise in my own home. It’s a pretty landscape on a late federal mirror.